Benjamin Baratz is a Senior Partner, Chair of the Corporate Litigation Group and Chair of the Israel Business Practice. As part of his work, Benjamin leads the Corporate Litigation and Real Estate Groups, utilizing his vast experience in all aspects of civil and commercial law. 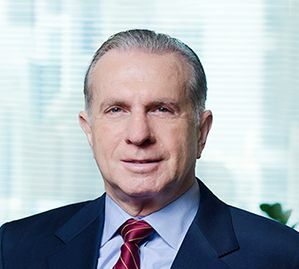 With over 37 years’ experience as a seasoned litigator, serving before all levels of Israeli courts, tribunals and arbitration, Benjamin has represented numerous clients, ranging from global leading conglomerates to rising start-ups and their entrepreneurs. Benjamin also led high-profile cases which ultimately resulted in precedent rulings, set by the Israeli Supreme Court. Additionally, Benjamin represents clients in insolvency and liquidation cases, accompanying creditors and shareholders and represents parties in motions for injunction following liquidation proceedings. Benjamin also dealt with complex, broad-ranging separation agreements between spouses, siblings and alike as well as multi-faceted matters regarding inheritances and estates in Israel and abroad. Alongside his litigation abilities, Benjamin draws upon extensive knowledge in asset sales, and commercial, industrial, residential and mixed-use real estate projects. Benjamin represents various construction companies, real estate developers and individual entrepreneurs in their respective fields. When in need, Benjamin represents these clients in construction and schedules delay disputes as well. Further, Benjamin has taken part in a wide range of public activities over the course of the years. These include participating in an ad hoc committee that was formed by Prime Minister Ehud Barak for the purpose of negotiating peace agreements with Syria and Lebanon, the committee acting on behalf of the Ministry of Finance for selecting auditors for governmental entities, as well as acting as the secretary of a committee formed by Prime Minister Yitzhak Rabin for reviewing government policy on immigration and absorption . In addition, for several years, Benjamin acted as chairman of the “Nitzan” disciplinary court, within the framework of which he represented the Israeli Bar Association on different occasions including in front of the Supreme Court. Benjamin is also a member of the Board of Governors and the Auditing Committee of Haifa University, as well as currently serving as the Honorary Consul of Romania in Israel. In 1982, Benjamin founded Baratz & Co., which merged in 2013 with Pearl Cohen to provide full service, cross-border legal support to its clients.